Everyone in the classroom was changed into various monsters.. And this is about group survival story. With each unique characters and their interaction on their changed social standings. Unkown world full of dangerous monster. And like ussual, I find how a weak MC struggling in survivals are more fun to read then an OP ones. I really wanted to enjoy this LN, but it's just has some flaws that made me drop it after the second/third arc. So, take this review with a grain of salt since things might've changed after I dropped it. First off, if you enjoy extremely positive and optimistic MCs, then you'll enjoy this. The problem for me is that the MC is just too positive and optimistic. Don't get me wrong, he has his moments where it feels like he acts like a real person capable of disappointment and anger, but... more>> then he just immediately lets things go. In fact, the story had a huge potential to make him feel more in-depth since he gets turned into a skeleton, but that gets swept under the rug and makes him feel more like an observer for everyone else. At the very start of the reincarnation, you get a glimpse that this might actually be a tragic hero with complicated emotions. He states that he doesn't possess any senses, he can jam his fingers into his eye sockets and still see, and he's extremely weak. The problem is that rather then have him go through that emotional collapse since he lost nearly everything that makes him human, even more so than most of his other classmates, he brushes over it immediately. He becomes a one-dimensional character used to become a crutch for everyone else to stand on. The MC doesn't feel like an MC, his entire purpose is to make everyone else look good. And, that could be made interesting... except, he seriously has no problem with it. I believe at one point, he even admits that he knew that the friend that betrayed him was always really just using him to make himself feel better, but he doesn't have a single reaction to it. I could be wrong, though since it's been a while. Another thing that bothers me about the MC is that he's only around to make everyone else shine. That's not inherently a problem, but it feels like it takes it to the extreme. It doesn't feel like he himself is progressing in any way. This is just a matter of taste, so this may be up your alley and I recommend giving this LN a read. The romance, as far as I've read, feels unsatisfying as well. One girl gets all his attention, while another's entire existence is just to say, "I'm so jealous!" Maybe it's suppose to be more along the lines of comic relief, so who knows. So far, each arc has a smooth, cohesive plot. The first arc was well-written and felt like a movie script. The second major arc is still in progress, but I have high hopes for it. An entire classroom of students are reborn as monsters in a foreign world. They have no idea where they are and have to struggle to survive as they adjust to their new abilities. Unlike a lot of other fantasy reincarnation stories, there is no helpful stat system or cheats to explain their abilities or how to... more>> do things. They struggle and squirm and figure out things by luck and chance. Of course, the class hierarchy is thrown upside-down as everyone's looks and abilities are different from before. They have to discover how they were sent here and how to return home. Not to mention, they need to learn how to use their abilities and possibly return to human form. Some reviewers have complained that the MC is very gentle, accepting, and forgiving. Later on, we learn that he is just very empty and has no passions of his own, which is why he was turned into a skeleton. It seems their personality flaws from before reincarnation heavily influenced the monsters they were turned into. In order to become stronger, they have to face their flaws head-on and work to change themselves. This will be great for character development as the series continues. All in all, this series is a time-sink if you're looking for one. It ranges between a little boring at worst and a little interesting at best with some major disconnect between the setting and the actual story. Wow, let say interesting but not adrenaline rush /thriller. That what I can say after reading few chapters. MC can say no brain. The genius is the class idol who she turn into slime. The story is about try survive in fantasy world. That all. A unique story without MC being OP cheats. The students did not end with killing each other like most classroom transportation but there is still prejudice with the strong and beautiful toward the weak and ugly. It's a okay read, until the end of the first arc that is after their dungeon completion. The rest when they start getting contact with humans isn't that appealing. 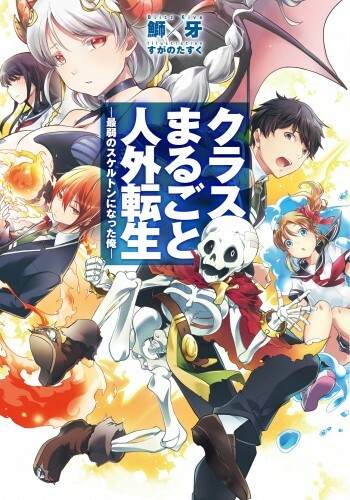 I really enjoy Japanese light novels, when it is written as a light novel. Sadly, I can't enjoy one that is written as if it were a manga. Almost more like a screen play than an actual novel. A focus on Sound effects + Facial expressions, and short meaningless conversations that has little stylized story telling. The idea for this story is great. I would love to read a story about it, or use the pictures in a manga to supplement shallow story telling. But sadly, it falls short.